The Autumn Equinox ritual was a performance of The Gnostic Gaelic Rite with our most experienced Priest and Priestess team who ad libed as the spirit moved them on the occasion to add an incredible degree of magical potency, operating with the Station of Fis, the Cauldron, in West. I am a thelemite, and I belong to a thelemic Order. Many people assume this means I belong to the OTO, or Ordo Templi Orientis, which is the largest and most well known of the Thelemic Orders. However I have not and do not belong to this Order (though I am a congregant of the EGC). I belong to a small and independent Order called the Irish Order of Thelema. Of course the term ‘independent’ could also be easily applied to the OTO as a self sovereign organisation, but I mean this much more in the sense of an independent bookstore. While OTO has lodges across the world which have a certain culture and way of running their ‘bookshops’, there are also those who, out of reading and really enjoying books decide to open a bookshop that reflected their specific vision and emphases. We are thus independent of those streams of established practice and history, even though we are inspired and informed by them. But enough of comparing or referencing ‘in relation to the OTO’. Don’t get me wrong, I think the OTO and their work is great and very important (and I know some wonderful thelemites who work with OTO), but there was an unfortunate time in the history of the thelemic movement where lots of people and groups were claiming to be the OTO, or like the OTO, or better than the OTO and so on so forth. ::Yawn:: Luckily those days are behind us, and there are increasing numbers of small scale groups, organisations and Orders which are bringing Thelema in new directions, or with specific emphases and focuses without piggy backing on other Orders. So why an Irish Order of Thelema? What impulses does it carry? And why does it appeal to me? The Irish Order of Thelema finds itself working in an idiosyncratic way with the specifics of the land we live on. While this system is geographic and not necessarily universally applicable, we get inquiries and requests from the four corners of the world asking to join or to bring our system to their country. We encourage individuals to look around and see what other Orders are active in their country as well as to feel empowered to create local activity and local expression as they will. It was always part of our intent to be a very explicit example to others internationally and the Order of Thelema is an international Order of which we are the Irish branch (and currently only branch? We are happy to hear from others worldwide with similar endeavours) Our policy is to encourage others to follow our example in regard to their own culture, autonomous but cooperative. The Irish Order has a culturally specific initiatory cycle through the powers of the Irish provinces, but beyond the theurgic journey of awakening there is the question, what then? The Irish Order of Thelema also acts as a social laboratory, with three additional rites which are areas of research and practice. Each of these is a reflection of one of the three chapters of Liber Al vel Legis, the Book of the Law. These are necessarily of a more universal and experimental nature. Research and practices for living with the law of Thelema as exemplified in the Book of the Law really belongs to a social experiment that reaches beyond the Irish context. Thus this is an area of work for an International Order or cooperation of Thelema, with the opportunity to collaborate, share and create social, political and magical forms that can be both social laboratories and eventual models for real change in accordance with will. We are a modern thelemic group, and we do not claim masonic style lineage or ‘entitlement’ from any outer Order, nor do we acknowledge temporal power as having any significance beyond its own immediate sphere of function. We are, on one hand, a group of self-contracted people who have come together and are bound by contract and common culture to create the Order, however we have other aspects that connect us with the land and its unique expression through the Order, and other aspects that connect us with both the thelemic current and the ultimate source tradition. Today there are a lot of groups around that have started to define themselves through the idea of egregore, that there are elements of tradition that through repetition and longevity are alleged to build up an equivalent independent presence or identity on the astral. In Ireland there is a perceptible sense of tradition and entity, but it is not experienced as just an astral presence outside ourselves and the immediate world. There is an eminent sense of the Gods, and stories, and cosmology that can be experienced in and through the land. This is a difficult experience to convey, and like the egregore of a group or stream, it remains an abstract concept until it is experienced. There is a fitting resonance in the land with the work we endeavour to do, and a resonance with the land by those actively engaging with this work. 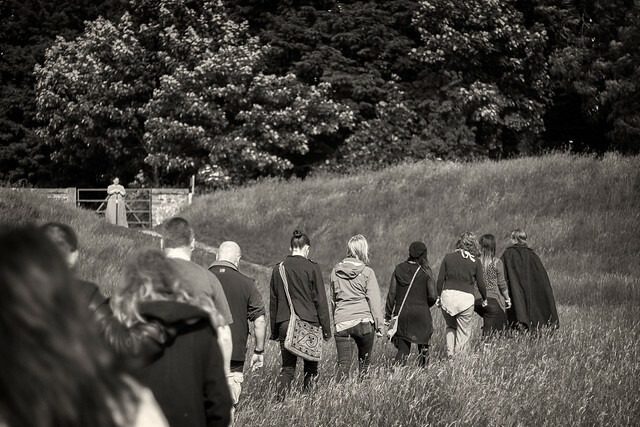 This is the uniquely Irish element which forms part of our syncretic tradition and which, in its component parts, is often shared by others immersing themselves in the land and Her traditions. In other groups this very specific flavour, resonance or stream may be different, but is most likely there in some respect. There are also elements of Thelema which have an egregore. In a very general sense this is often described as the aeonic or 93 current, but beyond the immediate social implications of thelema there is the Golden chain which links us to the very source of the tradition. This golden chain is both the inheritance of certain ideas we wrestle with and practices that impart methods of achieving higher levels of consciousness, and a continuing line of communication by those who actively use these methods with the source or intelligence of the Tradition. The full implications of this are best understood in the context of Aleister Crowleys own initiatory journey, his founding of the A.’.A.’., his reformulation of the OTO in accordance with the law of Thelema, and the repercussions this has for later expressions of thelema. The understanding of this source is explicitly clear in the literature of the A.’.A.’. while in the OTO the office of the OHO or Outer Head of the Order speaks to an Inner Head or at least awareness of this source. In an Account of the A.’.A.’. the relationship between the A.’.A.’. and outer Orders is described as follows. From all time there has been an exterior school based on the interior one, of which it is but the outer expression. From all time, therefore, there has been a hidden assembly, a society of the Elect, of those who sought for and had capacity for light, and this interior society was the Axle of the R.O.T.A. All that any external order possesses in symbol, ceremony, or rite is the letter expressive outwardly of that spirit of truth which dwelleth in the interior Sanctuary. Nor is the contradiction of the exterior any bar to the harmony of the interior…. But all exterior societies subsist only by virtue of this interior one. As soon as external societies wish to transform a temple of wisdom into a political edifice, the interior society retires and leaves only the letter without the spirit. It is thus that secret external societies of wisdom were nothing but hieroglyphic screens, the truth remaining inviolable in the Sanctuary so that she might never be profaned. But remember this clearly, that the Law cometh from the A.’.A.’., not from the O.T.O. This Order is but the first of the great religious bodies to accept this Law officially, and its whole Ritual has been revised and reconstituted in accordance with this decision. While the OTO serves as the first, and largest outer temporal vehicle to promulgate the law as the word of the magus of the aeon, others were expected to follow and both spread and diversify the manifestation of the law. Liber CCC then goes on to describe diverse ways to extend the law through temporal vehicles including education, university study, social impulses, publishing and more, a movement happening today through various bodies of endeavour. As well as the temporal vehicles which spread the sublimely simple word of the law, the law as applied to the course of everyday life and a confirmation of the law inherent to human nature, there are deeper layers of aspiration and attainment described as the ordeals of knowledge and conversation of the Holy Guardian Angel and the crossing of the Abyss inherent to the system of the A.’.A.’.. At a certain point in the progression of an aspirant to the A.’.A.’. there is attainment. The aspirant receives a word upon which a new school of thought is founded and they expound on this as an entire cosmology. For those who accept the law of thelema as an aeonic utterance, this individual attainment supplements the universal nature of the law in our age, forming an outer Order or movement of aspiration and attainment that expresses a unique emanation of the law. We are one such body of endeavor, and these are exciting times for the development and progression of a still young philosophical, cultural and arguably religious movement. We are also aware of others who are engaging in these small scale experiments as thelemic covens, groups, colleges, Orders and many more and diverse forms and in writing this I wanted to highlight the importance of continuing social experiments, idiosyncratic manifestations and doing what feels right. It is my hope that with the growth of Thelema, there will be increasing numbers of interesting projects and experimental forms as we spread the law of liberty through pluralism and diversity. We are currently seeking submissions for inclusion in the issue for release in Summer 2017. Significant contributions (of 5+ pages) will receive a free copy of the journal or an A5 advertising space to promote your book or initiative. Shorter submissions will receive a digital edition of the journal. If you know of interested individuals or interesting voices please pass this on. The first volume of the Journal of Ogam Studies was published in 2003, to include the research of Fr. Stoirm. This research was later integrated into the book The Poets Ogam: A Living Magical Tradition by the same author. The original vision was to create a space where ogam research, both academic and as a living system could be presented side by side, as well as artistic renderings of the ogam. We would like to create a space for inspiration, dialogue and cross pollination. We published a 2nd issue in April 2016 and would like to continue with this project by releasing a 3rd at the Summer Solstice (late June) 2017. Fortified Island Press is the publishing arm of the Irish Order of Thelema, a not for profit community based organisation. All proceeds go to the costs and maintenance of a temple and Community space in Belfast, Northern Ireland and towards future publishing ventures. Lughnasa saw one of the biggest ever turn-outs at an Order event with approx 50+ people enjoying the sun and the legendary Lughnas a Games which hard-working members have ran locally for an incredible 17 years! Spears were thrown, arrows were shot, sword clashed on shield and all enjoyed! There was also a performance of a magical theatre piece written by a member. Later that evening a very special banquet was held in the temple to commemorate the 5th anniversary of the death of the Orders founding Grandmaster Wolfe. A commemorative CD of his music was also launched. His memory was well honoured. The Summer Solstice ritual at the Giants Ring was led by the National Sovereign who designed a unique ritual for the occasion to symbolise the Sovereignty of the Land, with a Priestess to each of the Quarters and in the centre. The ritual involved a circumbulation around the earth works of all present which was wonderful to behold and struck a chord with something that would no doubt have happened way back when this earthwork was built. For the last 2 years we have posted a years review from June to June. It has been another busy year, and looking back at all we have done in the last year its not surprising. – At the summer solstice we performed a ritual at the Giant’s Ring which had around 20-30 in attendance. It was celebrated as a ritual Wedding of the King and the Land via personifications of Lugh and Macha. – For Lughnasadh it lashed down games so the traditional lughnasadh games were traded in for a more chilled festival with food, sharing and fun. – For the autumnal equinox we saw a well attended event in Belfast with the Reconciler Ritual. ~ At Samhain we celebrated in our temple in Belfast with a festival for the dead. ~ For the Winter Solstice the Belfast Grove celebrated the season with ritual and fine food. ~ At Imbolc Belfast Grove performed a seasonal ritual. ~ For the Vernal Equinox the National Sovereign led the grove ritual. It was a ritual of purification in which all present where involved. A group banishing, purification and invocation was performed that each person may get rid of anything they don’t need, purify what’s left and invoked what they need to accomplish their True Will in the coming year. It was a potent rite enjoyed and appreciated by all present. ~ In April there was the celebration of the Three Days with an AGM and readings of the Book of the Law. ~ In April we had a workshop on the theurgic formula of Magick in Theory and Practice, including general content on the dynamic of ritual. ~ For Beltaine there was Poets, Bards and Blaggers, with performances of music, poetry, storytelling, dramatic performances and more. ~ Members of the Order continue to facilitate the Belfast Pagan Moot which happens in the temple space once a month. – We formed a ritual proficiency group to train community celebrants and to impart ritual skills. This group of members meets on a regular basis. ~ We have offered space to the esoteric, pagan and alternative communities for ritual, workshops and meetings. ~ We have also continued to offer liferites including handfastings, greater feasts (funerary services), child namings, and other associated rites. ~ We continue to offer initiation into our unique system and spaces to explore the rituals and their precepts and to look at and work on the associated coursework. ~ We have had a donation of hundreds of books by a member to found a members library and we are currently working towards housing this and making it available for members use as soon as possible. Looking back we would like to thank all those who have organised, participated, volunteered and made all this possible. We’ve had lots going on, and we’d like to see this continue. Most activities and projects have arisen from the impulses of individuals who had an interest, and either offered to share it, to organise something or otherwise pioneer an impulse. If there is something you would like to happen, be it an area of work, a study group, a working group or something else entirely vocalise it, ask for help and help to make it happen. In Autumn 2014 one of the members donated a sizeable library to the Order with the purpose of establishing a cornerstone to a reference library and loan library for members. This collection includes work on the qabalah, ritual magick, paganisms, shamanism, celtic studies, divination and more. Some of the donated library is indexed on Librarything. This now serves as a foundation catalogue for this library but is incomplete and will be updated and expanded as the library is indexed. Our goal is to put up book shelves, finish indexing and put in place a system for loans and reference for members of the Order. It will be housed in the Belfast temple/ community space. If you would like to help us with this work, donations are welcome. We would appreciate donations of money (for shelves), shelving, time for indexing, and donations of relevant books (with an emphasis on esotericism and philosophy). Have you ever wanted a short, succinct introduction to the work of the Irish Order of Thelema? Well now you can have one. At Summer Solstice of 2013ev we released a booklet to introduce what we do in no nonsense language which you can read below. This has also been recently revised. If you are interested, check it out. And if you know others who may be interested in the Order and its work feel free to pass this introduction on to them. For more publications from the Order see our Publications Page.